Then the king [Darius the Mede] returned to his palace and spent the night fasting. He refused his usual entertainment and couldn’t sleep at all that night. This scene is set some time after the stone has been rolled across the entrance to the lions’ den, and sealed by king Darius and his nobles. It is early evening. The sun has set, and the primary source of light in this scene is from torches held aloft by the guards and servants, lighting the way fro the king back to his palace. 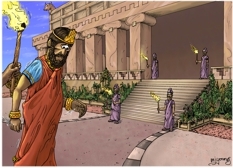 King Darius (in red and gold robe). Guards on the palace steps holding torches. A servant behind the king, holding a torch. I imagine this scene being some time after the king has had Daniel put in the lions’ den. King Darius is slowly walking back to his palace, which is the large building in this scene. We know from the Bible verse above that the king refused any food and his usual entertainment and spent the night awake, no doubt worrying about Daniel.